The annual Kid's Choice Awards provides the platform for young artists and actors to shine and receive recognition. It is also the perfect platform for young artists and actors to showcase alike to showcase their creative style and show out on the orange carpet. Held at the Galen Center in Los Angeles, California, this year's KCA's showcased just that. With the ceremony taking place during the current Spring season, current trends such as bright, bold colors and crisp cuts were current throughout celebs alike. Check out the nominee's for best dressed below. Actress/Singer Coco Jones looked bright and beautiful in a yellow neck bustier, blue floral pencil skirt and electric blue ankle-strap heels. Electric blue and bright yellow look complementary with one another, embody this look with a yellow jacket, electric blue heels and matching electric blue ballerina pumps. Here we see Actress/Singer Kira Kosarin fully representing the electric blue theme once again in a futuristic, spacey-type cut dress and accent gold belt and accessories for extra shine. Glee star, Lea Michel looked rosy-chic in this gorgeous soft pink, lace dress. Lea topped off her tickled pink look with an accent beige platform heel. Up-and-coming songstress, Pia Mia opted for a more edgier look with a sea blue tube top, and rock star denim button up sleeveless jacket and baggy jeans. Her electric silver heels also add a touch of classy glam. As for Best-Dressed, the winner is...Ariana Grande! Without a doubt, Singer/Actress Ariana Grande perfectly embodied the essence of the KCA's with this show-stopping orange dress. The white platform heels and customized Nickelodeon character clutch balanced out her warm tones with cooler ones. Want to steal Ariana's bold style? Look below for fashion and make-up inspiration! 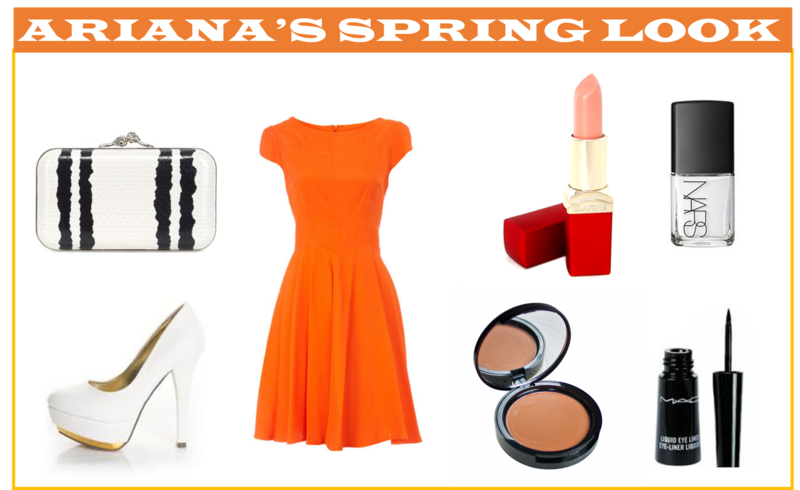 Pair your bold and bright burnt orange Spring dress with a makeup look that is simple yet girly. Draw attention to your face with gold and peach tones on your lips and cheeks and top it off with a seductive cat-eye, winged eye. Who do you think was the best dressed at this year's KCA's?